At long last, the often requested quickstart guide—A very short introduction to LibraryThing. 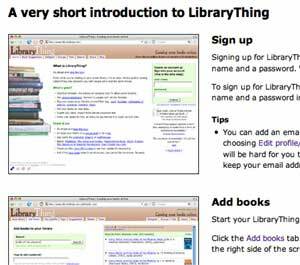 It’s intended as a quick overview of LibraryThing’s features, to help new members get started, all the way from signing up to creating a blog widget. It’s hard to come up with the balance of enough information to help without overwhelming, so I’m looking for your feedback. What should be added, changed, deleted, clarified…? Discussion in this talk post. Authors. It was at last year’s BEA that we launched the LT Author program. After Tim and I spent a day walking around trying to describe LT in a nutshell**, we realized we had been telling people, “it’s like MySpace, but for booklovers.” Well, MySpace is all about bands and musicians promoting their music. Wouldn’t LibraryThing be a good place for authors to do the same? What better place to promote your new book than a website full of avid bibliophiles? Best of all, they’re not just authors who clicked a box. To be part of the program, you have to have a LibraryThing account and put in at least 50 books. What is your favorite author reading? Find out. Neil Gaiman’s author photo. Members have added over 15,000 pictures and photos of authors (see recently added ones), with alibrarian and leebot leading the pack. They deserve some kudos—it’s actually a pretty intensive process, often involving writing authors, publishers, or photographers for permission, so the sheer number of photos is all the more impressive. Plus, it makes for a nice gallery. LibraryThing members have also added over 92,000 links to author pages—links to author home pages, blogs, publisher pages, Wikipedia pages, interviews, articles, fan sites. That’s a lot of links. Booksellers. We’d love to add more bookstores to our “bookstores that integrate“—adding availability and pricing information on every work page. We’ve got only three so far, but we’ll be adding two major “chunks” of them in the next few months—to at least 100 total. It’s a great way for people to be able to see at a glance if a book is at their local bookstore. Publishers. So far, we’re not doing anything for publishers! But there’s a big announcement coming soon. Be on the edge of your seats! 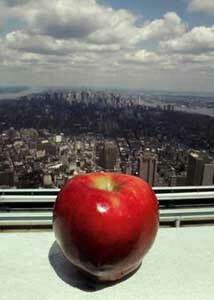 So what can we do to make LibraryThing big at BEA this year? I made a BEA 2007 group, post there with ideas of where we should meet (I’m thinking maybe a restaurant near the convention center?). New Yorkers, I call on you for suggestions! We’re also thinking about bring a bunch of CueCats, and giving them out to authors, to entice them into becoming LT Authors… What else? *[Written by Tim] Shelfari doesn’t release any statistics. But they do release the top 20 bookshelves. The 20th bookshelf on Shelfari has 1,360 books. LibraryThing has 1,378 members with that many. Hence 20/1,378 = 68.9 times as large. You will note that we do not abuse our other competitors–just Shelfari. Some of them are quite good! There’s a good thread going about them. We want people to check them out, and come back to tell us how to improve LibraryThing! Everything on the web is better if it’s faster. Slow pages are a silent killer. So we’re working to speed thing up. We’ve long done “situational” caching. But our growth is relentless—we’ll hit 200,000 registered members today—and we’ve had no good, generalized solution. We’ve recently been working on two solutions, for database and page-level caching. Together they should speed up certain cacheable pages, like works, authors and tags. The more resources we can free, the faster the uncacheable pages, like Talk, will become as well. Subject pages were a big problem. The worst took a minute to load. When Google’s “spider” program went at them, with one request/second, the servers would sweat. Subject pages are now cached whenever someone hits a page, and stays so for at least week. Subjects are a test. There are some kinks to work out. (For example, changing the non-English translations doesn’t immediately clear all affected pages.) Once we get where we want, we’ll roll it out page-caching wherever we can use it. Query caching will follow. You’ll notice many more Wikipedia links from work pages. The total has increased by about 200%, and the coverage by at least that. I’ve redone it, this time also looking for telltale title/author patterns, and running the matches against LibraryThing’s vast and usefully messy dataset. The logic is somewhat fuzzy and therefore imperfect. But I haven’t noticed any problems. Notably, it caught casual references to books, not just structured ones. For example, the article on Science wars mentions Kuhn’s work in running prose, not in the bibliography or footnotes. I haven’t updated our free Wikipedia citation feed. That maps articles to ISBNs, but the new data is work-based. If anyone wants to use the new data, let me know and I’ll tackle the problem. Cool as I think it would be, I haven’t seen any libraries adding Wikipedia links to their catalogs yet. *The fact that its a new feed, and the somewhat fluid interactions between ISBN-based and work-based matching make it tricky to estimate, but it looks like a 200% increase.